If you want to improve your softball or baseball game, the best way to do so is by using a pitching machine. This machine helps you practice hitting on your own. With a pitching machine, you don’t require a team, a coach or a partner to practice hitting. This implies that you can practice at your convenience and for more extended periods. Players who are committed to enhancing their hitting skills, pitching machines are the best options. The pitching machines come from various manufacturers who make diverse varieties. So, it is a hectic task to choose the best machine as it might appear. Most people believe that to select the best machine all you need to do is go through reviews made by consumers and picked the machine that has a higher rating. Well, one can be lucky, but it does not always happen to be the best choice. 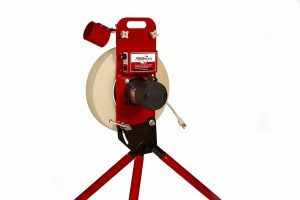 To assist you in choosing the best product we have researched and reviewed the top ten best pitching machine on the market. 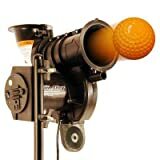 The Heaters sports Alley lite is one of the few best pitching machines available on the market at a very affordable price. For safety purposes, its wheel is fully enclosed on the inside to reduce any accidental risk that may arise. It is built with a powerful a/c motor which throws lite-balls at 60 mph and soft-lite balls at 40 mph. If you happen to do practice for a long time, then this machine is an ideal choice as it can run for hours. It is also built with an adjustable pitch height. 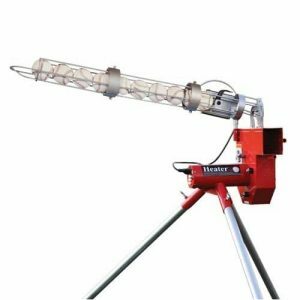 The machine is designed with a tripod stand which is made of steel. This comes in handy as it provides firmness especially when the motor is throwing out the balls. Are you looking for the best pitching machines for coaching your team softball or baseball? Then the first pitch baseline pitching machine will give an excellent service. This machine will throw baseballs and softball at a speed of 70 miles per hour which is relatively fast enough but also safe. It’s lightweight for easy transport from one place to another. 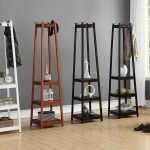 It is supported by a tripod stand which is strongly built with durable materials. The tripod stand comes in handy especially to withstand the vibrations caused when throwing out the balls. It also has a reversible leg while its height can be adjusted to acquire the desired height. If you find yourself or love doing pitching alone, then this pitching machine is made for you. It comes with an automatic ball feeder. You can feed it to a maximum of 9 balls. The machine releases the balls at 15-second duration only giving you time to catch your breath. It pitches softballs at 50 mph which is very safe. Its wheel is completely hidden for safety purposes while the tripod stand is genuinely made with durable materials especially for it to be able to withstand the vibration caused by the motor as it throws out the balls. The height is also adjustable especially to get to the angle onto which suits you best. This machine comes at a very pocket-friendly choice. 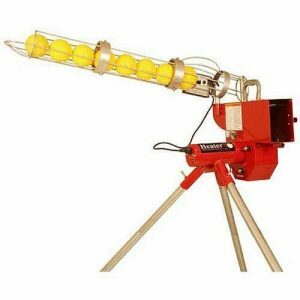 The Heater sports baseball pitching machine is a baseball pitching machine that has an automatic 12 ball automatic feeder. The machine automatically releases the balls at a 12 seconds time span. It has a 10-speed control system that allows you to adjust the speed onto which it is running from a speed range of 15-50 miles per hour. It also has adjustable heights especially to set the angle on to which you want it to release the balls. It is made of a tripod stand which is very strong and very helpful in absorbing the vibrations caused by the motor as it throws out the balls. If you love practicing alone, this should be your best choice. This Pitching machine is made for kids to help them practice in their home backyards. 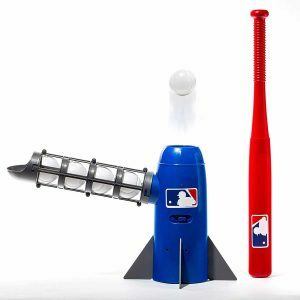 Give your kids a new reason for loving baseball by buying them this awesome pitching machine. This machine has an automatic 5 ball feeder and lets out the balls after every 7 seconds. The 5 ball capacity is convenient as it gives your kids time to catch their breath as they refill the machine with more balls. This is the perfect way to improve your kid’s hand-eye coordination especially if your kids are first time players. The 5 plastic balls come with the machine. The base of the machine is wide enough with extra protruding edges to provide stability as the motor pushes the balls out at speed. 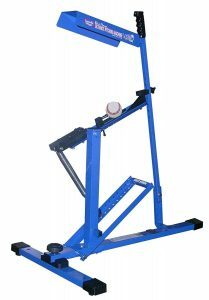 If you are willing to do that extra challenge even in practice sections then the Jugs small-ball pitching machine should give you satisfaction. 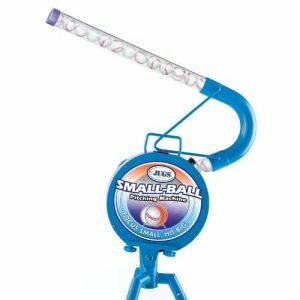 This machine uses small balls thus making it a little challenging because as they say, it is very difficult to hit a small round ball coming to you at speed. Unlike other machines, these machines come with both manual and automatic feeders. The automatic feeder has a maximum ball capacity of 25 balls and will release them in 5 seconds. 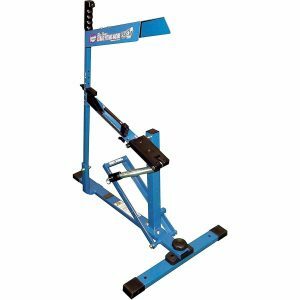 This machine is built with heavy-duty steel with adjustable heights. The heavy duty stand also comes in handy as it helps the machine to cope with the heavy vibration caused by the motor as it throws the balls out at speed. It throws out the balls at a speed of 75 miles per hour. 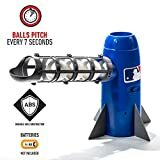 This pitching machine is built with a unique design. It requires no battery or anything like electricity, and yet it throws baseballs at a speed of 50 miles per hour. It is very versatile as it can also be used in softball, tennis, and cricket as well. It can also throw different types of balls without any problems, and the angle can be used to make long or short throws. It is made of durable and robust steel materials while its designs make it possible to move it around, this is also aided by its weight which is not too heavy. This machine should be your best choice especially because of its versatility, and both players and coaches can use it while it’s also adaptable to being used by kids. This is another pitching machine that won’t require batteries electricity for it to run. It is built with sturdy steel material which makes it very durable while its design makes it very portable. It throws both softballs and regular baseballs at 19-45 miles per hour speed. For lightweight softballs and baseballs, it can throw them at 60 miles per hour speed. 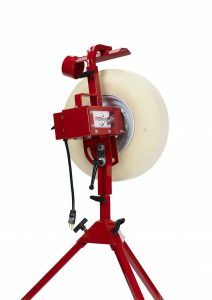 This pitching machine can be used to throw accurate pitches, infield and outfield drills. It is a perfect fit for everyone as it can be used by all ages, from kids to adults. The machine also comes at a very pocket-friendly price. This is a heavy duty pitching machine with a 1/3 HP motor. This machine pitches fastballs both softballs and baseballs. The original combo throws balls at a maximum of 80 miles per hour for baseballs and 70 miles for softballs. 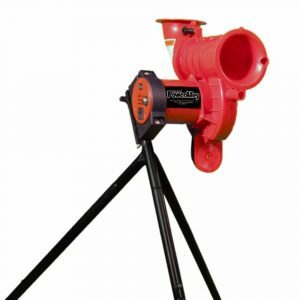 It is supported by a tripod stand which is made of strong steel materials which makes it durable and maintains firmness when the motor is throwing out the ball. The speed at which the machine runs can be adjusted. Upon buying this, you get a 5-year warranty. 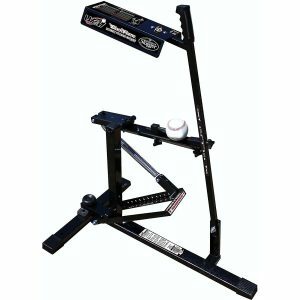 The Louisville Slugger is one of the top-rated and top-selling pitching machines on our list. It is fully manual as it does not use batteries or electricity. It weighs only 23 pounds making it very portable due to its lightweight. This machine can be used either indoors or outdoors. It is very easy to use this machine. It has adjustment knobs to adjust the throw speed. For hard balls, the blue flame can throw them at 18 to 45 miles per hour while it can throw softballs at a maximum speed of 60 miles per hour. This machine can also throw any balls including softballs without damaging them. This machine is easily set up and is very affordable. Type of machine you need – You should know what type of machine you need. Some machines best suit beginners, some suit professionals while some are strictly made for kids. 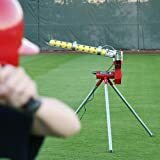 If you are on the search for a pitching machine for your kids or beginners, it is important to get the machines that don’t run a high speed since they are only beginning. Durability/price – Durability is a very important factor when purchasing anything. Everyone would love to buy something that will last for a longer time. But how do you know the machine is durable? 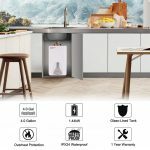 Other than the obvious fact to look at which is the material the machine is made of, you can also know the machine maybe long-lasting if it has a long time warranty. Make sure you buy something worth the high price. We also say better to buy something at a bigger price as long as it will serve you for a longer time. Portability – You should know the treason you are buying a pitching machine. Some machines are quite heavy, and it is difficult to move them around if you want to move them. Find a machine that you can move around especially if you are not permanently settled. Pitching machines aid us a lot especially when we are practicing hitting. Some will completely wipe out the need for a second person as you can operate it on your own. It is however essential always to be present especially kids are practicing since some of these machines use power and mishandling can lead to accidents. We hope that after going through our reviews now places you on a better position to make a good choice on a machine that suits you best.